There has never been a team like the New York Yankees. No team has won as many World Series titles. No team has hit as many home runs. No team has had as many great superstars playing for them: Ruth, Gehrig, DiMaggio, Mantle, Berra, Ford, Rivera, and Jeter to name a few. No team draws as many fans--and enemies--as the Yankees. The New York Times Story of the Yankees includes 382 articles chronicling the team's most famous milestones-as well as the best writing about the ball club. 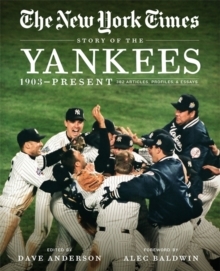 Each article is hand-selected from The Times by the peerless sportswriter Dave Anderson, creating the most complete and compelling history to date about the Yankees. Organized by era, the book chronicles the team's 27 World Series championships and 40 American League pennants; its rivalries with the Brooklyn Dodgers and the Boston Red Sox; controversial owners, players, and managers; and more. The articles span the years from 1903-when the team was known as the New York Highlanders-to the present, and include stories from well-known and beloved Times reporters such as Arthur Daley, John Kieran, Leonard Koppett, Red Smith, Tyler Kepner, Ira Berkow, Richard Sandomir, Jim Roach, and George Vecsey. This up-to-date, paperback edition, which includes Derek Jeter's and Mariano Rivera's last seasons and Yogi Berra's obituary, is illustrated with hundreds of black-and-white photographs that capture every era. A foreword by die-hard Yankees fan, Alec Baldwin, completes the celebration of baseball's greatest team.